Acrylic Photo Prints. Acrylic Photo Blocks You Design. Freestanding and with a 3D effect, these beautiful acrylic photo blocks that you design will add some flair to any desk or mantel. They are perfect as gifts or as additions for your own home. You can easily turn your best photos into incredible acrylic photo prints that can brighten up any day. Available in a choice of four different sizes, you can preview exactly how your personalized photo blocks will look in our design interface - all your changes will update in real time. With express delivery options and ready in just a day, order photo blocks now. There is no better way to display your beautiful images then with one of our amazing acrylic photo prints. 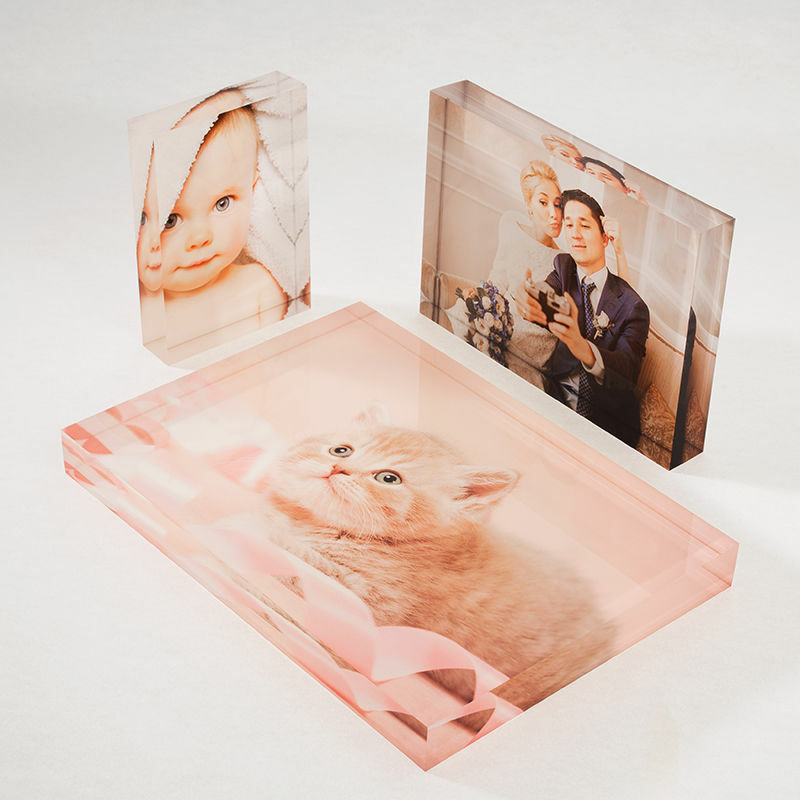 The 0.75" thick crystal clear acrylic photo blocks give the image a quality visual impact, creating a 3D-like effect and a gorgeous photographic display. Plus, the acrylic truly allows the bright and vibrant colors to pop through the frame. The reverse of your custom blocks has a matte white backing where your image is still visible, so please note, they're not fully transparent. Available in four sizes. Not only are our acrylic photo prints beautiful, but they are heavy-duty. The acrylic material makes them durable and long-lasting so that you can enjoy your photos for years to come. Photos on blocks make amazing gifts and are perfect for a range of different events and holidays. So get creative now and design your own photo block for Mother's Day, Birthdays, Anniversary presents, and more. The print was too bright compare to the original upload image. From placing my order to delivery it was all very smooth, no problems and the final product is brilliant. Delivery was within a matter a days. Will be ordering again. My photo in acrylic was superbly done flawless!!! We print photos directly into the acrylic, which then become, in essence, acrylic photo blocks. These acrylic photo prints can be personalized for the office, home or as a printed gift for someone special. They have such a distinct and bespoke appearance, and thanks to their highly polished finish, your photos have never looked better. Our print technicians take every care to ensure each block is printed with high definition, allowing small details and fine lines to look defined and clear. Your blocks are handmade by our team of craftsmen. Printed and polished to perfection to give you a personalized photo gift that can be treasured for a lifetime. The reverse of the block has a matte white backing, which gives it a smart finish. Care: Simply wipe your acrylic block photos clean with a slightly damp cloth to remove any dust or dirt. If you love the contemporary look, then these acrylic photo prints are for you. They are a fun and fabulous way to display photos, faces, and prints. They also make heartfelt and stylish gifts. The different size options are perfect for creating a series. Design your very own family portrait by printing photos of the whole brood on various sizes of photo blocks - larger options for parents and smaller options for the children. You can then display these proudly on your fireplace, coffee table or anywhere you like. The freestanding design allows them to be showcased on any surface. Anyone who enjoys showing off their family, friends, and travels will be a big fan of these acrylic photo blocks. Print your favorite picture of you holiday in the Canadian Rocky Mountains or the last family dinner. Because of their durable nature, they are great for children's rooms and nurseries, as you don't have to worry about them being knocked over and breaking. Why not create a family tree for your little ones, printing family faces onto the blocks and allowing them to display them as they wish in their bedroom? This stylish way to display photos is the perfect way to show your girlfriend or wife just how much you love her.